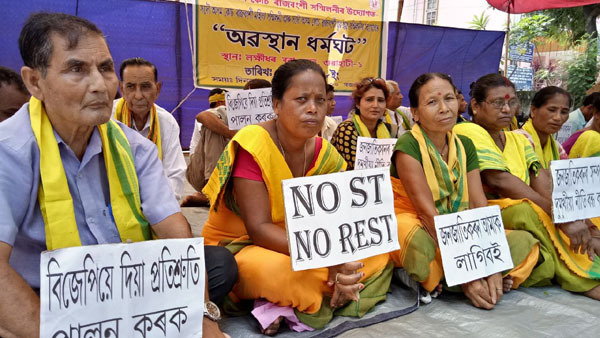 The All Assam Koch Rajbongshi Sanmilani staged a three hour sit-in demonstration on Monday at Lakshimdhar Bora Kshetra in Guwahati and demanded Scheduled Tribe status. Vice-president in-charge of All Assam Koch Rajbongshi Sanmilani, Sunil Kumar Barman questioned the Government, “Why do we have to struggle for our identity?” ST status is our legal demand, said Barman. Further the protestors demanded the Government to provide ST status before 2019 Lok-Sabha election. Both the leaders also announced the Sanmilani’s decision to launch a strong protest if the government fails to provide the ST status. The leaders informed that the date to stage protest at national capital has not been decided yet. The protestors shouted slogans like ‘BJP Government Hai Hai’, ‘BJP Government Go back’, ‘BJP Government Liar’, ‘No ST No Rest’ etc. during the demonstration. The protestors also demanded a special package of Rs 200 crores for the development of literary, cultural and socio-economic aspects of the Koch-Rajbomgshis. The protestors also demanded constitutional recognition of the Rajbongshi language. The Women wing and Youth wing of the Sanmilanai also joined the protest programme. The protestors also submitted a memorandum, which is addressed to Prime Minster Narendra Modi, to the Kamrup (M) Deputy Commissioner.